X-ray micro computed tomography (x-ray µCT or micro-CT) is a non-destructive imaging technique, using x-ray energy to create volumetric reconstructions of a specimen. This technique makes available a large amount of material from museum spirit collections for comparative studies of relatively rare and uncommon creatures. Most of my research involves using CT to examine morphological variation in animals. Schematic of the X-Ray CT process. I scan several individuals simultaneously, increasing the productivity of the scan process. 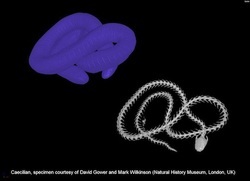 Here, three caecilian heads are aligned for scanning. Another way to scan several individuals simultaneously. Here five lizards are aligned. Anole lizards in Miocene Amber from the Dominican Republic and Chiapas, Mexico.